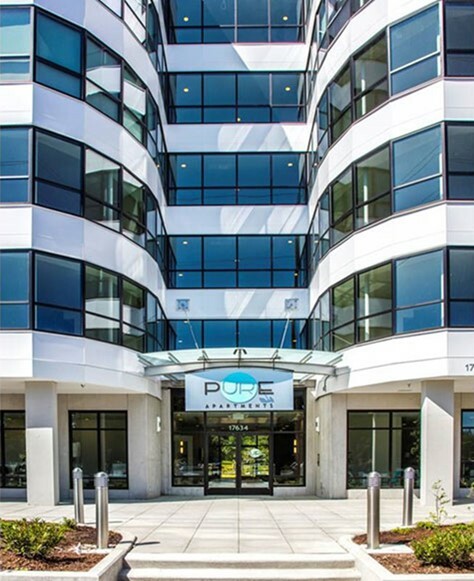 Walker & Dunlop, Inc. (NYSE: WD) (the “Company”) announces that it recently completed a $21,625,000 refinancing for Pure Apartments, a Class A property located in the growing Seattle submarket of Redmond, Washington. Capital Markets Managing Directors Jeff Robbins and Matt Ewig led the Walker & Dunlop team, which structured the seven-year, floating-rate refinance loan at a very competitive spread. The Freddie Mac financing also included two years of interest-only payments. Pure Apartments, situated just off U.S. Route 520, enjoys convenient access to downtown Redmond, Bellevue, and Seattle. The location is a prime choice for young professionals, only four miles from Microsoft’s Headquarters, and less than a half mile from the employer’s Millennium Campus. Several retail options and amenities within walking distance of the property include Target, Kohl’s, Fred Meyer, Chase Bank, Safeway, and Home Depot. In addition, Redmond Town Center is nearby and has over 100 shops, restaurants, lodging, and entertainment venues in an outdoor environment. Each unit within Pure Apartments is equipped with premium appliances, finishes, and fixtures. The property also features luxurious vaulted ceilings, with the option of walk-out balconies in many of the units. Top-of-the-line community amenities include a state-of-the-art fitness center, full-size recreation room, and the largest outdoor rooftop deck in Redmond. Walker & Dunlop is a leader in the commercial real estate industry and is becoming increasingly active in the burgeoning Pacific Northwest region. Ranking #3 with Freddie Mac in 2016, the Company has already completed over $2 billion in transaction volume with the government-sponsored enterprise in the first half of 2017. To learn more about Walker & Dunlop’s leadership position within the commercial real estate industry, read the press release celebrating our attainment of a top-five ranking with Fannie Mae, Freddie Mac, and HUD.